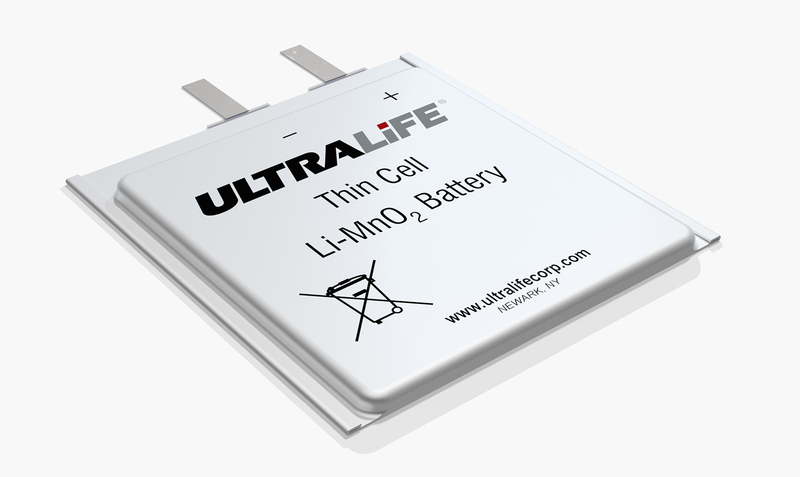 Ultralife Corporation has strengthened its Thin Cell range of primary (non-rechargeable) lithium manganese dioxide (Li-MnO2) pouch-cell batteries. The higher energy density and slim form factor of Ultralife’s Thin Cell technology makes it ideal for use in the next generation of internet-connected and wearable devices in sectors including medical, banking, highways, logistics, warehousing and security. Operating at a nominal voltage of 3.0V, the Thin Cell range of pouch-cell batteries from Ultralife offers an energy density up to 500Wh/l and 400Wh/kg. This is a much higher rating than the best lithium coin-cells available on the market, which offer an energy density of only 300Wh/l and 260Wh/kg allowing devices to deliver longer runtimes at the same size. Because the Thin Cell can be manufactured as thin as just 0.4mm, device manufacturers can make their devices smaller without compromising run time. As well as providing more energy in a smaller package, the Thin Cell also outperforms coin cells when delivering high discharge rates. This is thanks to optimised current collectors and means that the battery meets the demands of devices that need high bursts of energy, such as those with radio frequency (RF) transmitters. Designed for professional and consumer devices, Ultralife's Thin Cell battery is suitable for applications including RFID asset tracking systems in the logistics and warehousing sector, as well as wearable devices and drug delivery systems in medical environments. Other applications include bank theft tracking devices in the financial sector, smart devices in the security sector and toll pass tags in the highways sector. To meet the needs of demanding applications, the Thin Cells operate safely and effectively from -20˚ to +60˚C, which means they continue to work long after other batteries have frozen. The Thin Cell also retains more than 98% of its capacity after a year of storage at room temperature, so it does not suffer from the passivation that affects many other lithium chemistries. So, regardless of how customers store their battery, it will always be ready to use. The Thin Cell batteries from Ultralife are tested to the stringent requirements of UL1642 for safety, as well as UN testing for transportation. Combine this with the fact that the Thin Cells are terminated with nickel and stainless steel tabs so they can be soldered onto PCBs quickly, original equipment manufacturers (OEMs) can readily integrate the batteries into their devices for use in applications around the world.